October 31 is known to most people as Halloween, a day of candy and dressing up as all kinds of wild and crazy things. What most don’t realize is that October 31 is also Reformation Day, the day that Martin Luther nailed his 95 theses to the door of the Wittenberg church in 1517. 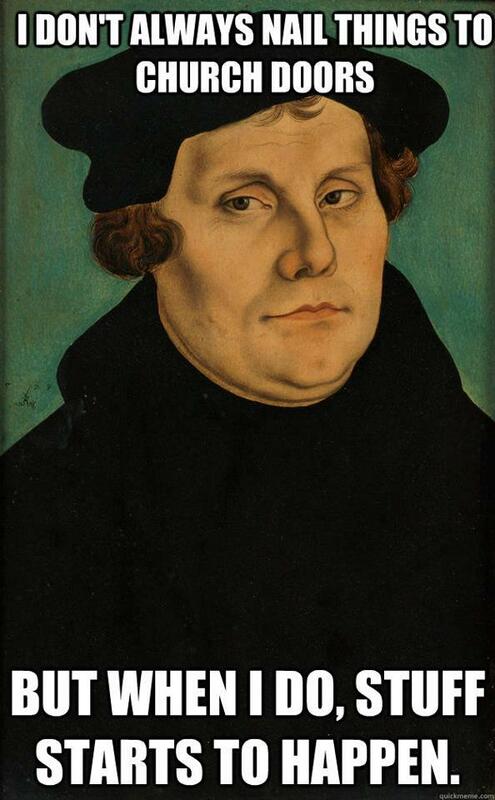 In Luther’s day, the church had gotten corrupt. Leaders with motives and loyalties rooted in power and greed and not in God’s truth had led the church to practices that were not only unChristian but that flat out went contrary to the Word of God. 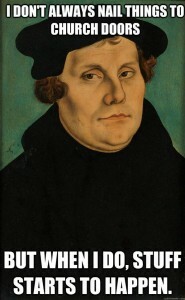 One of the many practices that Luther called into question was the selling of indulgences. For a few bucks, you could buy a certificate that would get you or a loved one out of purgatory. You could buy peace of mind and get your loved one into Heaven’s bliss – if you could afford it. Luther never intended to split the church but to merely correct its errors. As he studied the New Testament, he came to understand God’s love and grace and that, as Ephesians 2:8 says, “For by grace you have been saved through faith. And this is not your own doing; it is the gift of God.” It’s not something that could be earned but something that everyone has already received. One of the major reasons the church was able to get so off track was that the common people didn’t have the Bible in their own language. They were at the mercy of what the priest told them. They had no way to know what God really said and whether they were being led astray. Few people – even Christians – read the Bible. I read a statistic that said that 80% of Christians don’t read their Bible daily. Even though today it’s more available than ever, we’re not reading it. Anyone with internet access has at their fingertips every translation and language imaginable. If we’re not in the Word regularly how can we recognize errors in doctrine or even heresy? Christianity is seen by outsiders – and even insiders – as being about works. Talk to most people about how they know if they’re going to heaven and the answer that comes up most often is “I’m a good person. I’m going to heaven.” On TV and in the media, Christians are stereotyped as being “good people” and doing good things so they can go to heaven. It’s a terrible misrepresentation that leads to Christians being labeled as hypocrites when we mess up or fall down (which, face it, we’re human and we’re going to mess up). When Christianity becomes about “being good,” we compromise the Gospel and people’s eternities are in jeopardy. The church is often out of touch with the real world. In Luther’s day, it came through keeping the Bible and worship services in languages that most people didn’t speak or understand. Monks and church leaders, like Luther in his early years, spent their lives inside monasteries and churches and spent much of their time in prayer and worship. Noble things to pass the time, but the Gospel call is to take the saving grace of Christ to the world, not to stay holed up inside away from the world. Today, we’ve managed to reimagine the seclusion that existed in Luther’s day – even when we’re out and about: The Christian Bubble. We listen to Christian radio, read Christian authors, watch Christian movies and shop and Christian stores. Don’t get me wrong – those things are all great. But they are no replacement for our true calling to go and make disciples. So on this 495th anniversary of the beginning of the Reformation, where do we go now? We need to remember the Reformation. We need to remember the reasons the church off track, because they can creep back any time. We need to remember our purpose – to know Christ and make Him known – because in our purpose, we find meaning. We need to remember that Christianity is about grace alone, by faith alone, through scripture alone. We are saved by our faith, not our works and everything we believe, teach and confess needs to come from and submit to the Word of God. The Reformation continues today – nearly 500 years later. And it’s as important today as it was then.